Thank you for informing me that my petition is to be considered by the Public Petitions Committee at its meeting on Tuesday 27th January 2015. You suggested that I might like to make a short written submission for the meeting of the Committee informing me that this would be published online with the other evidence that the Committee have gathered for Petition PE1493. Before I offer a brief summary, a year on almost to the day from my last written submission, I would like once again to thank the Committee, and supporting staff, for continuing to explore how the people of Scotland might benefit from a Sunshine Act. I understand from your communication of the 20th January 2015 that the Committee, “despite numerous reminders,” has received no response from the Scottish Government. I am disappointed to hear this, particularly as the summary produced by the Scottish Government, in their letter of 17 April 2014, would appear to demonstrate wide failings in NHS Scotland’s Compliance with HDL (2003) 62. Given these failings, in December 2014 I contacted all 14 regional NHS Boards for further clarification and in the hope of progress. I have so far had reply from only 2 NHS Boards. NHS Forth Valley and NHS Tayside now have a central register of interests for all staff. Both have now made these registers publicly accessible. NHS Forth Valley: the current register includes the names of only 7 staff and all the other entries are by designation only. NHS Forth Valley’s register is therefore not complete in that it does not consistently identify individual staff. The Director of Education for NHS Forth Valley, confirmed last year in writing that he was “not aware” of HDL (2003) 62. The Director of Education also confirmed that Forth Valley’s “learning Centre” has “no budget that pays for educational meetings”. NHS Tayside: is the only other Health Board to reply to my recent request for an update and provided the public link to their Register. The register begins in 2011 and records 16 entries, and each without any identifying name. Ms McLeay, Chief Executive, stated in her reply of the 30th December 2014 “I agree that this public record of sponsorship is not complete and accurate at this point”. NHS Lothian: I have had no reply to my recent communication on HDL (2003) 62. The situation as recorded in FOI reply from NHS Lothian dated 6th May 2013 stated: “There are no other [apart from Board members] centrally held registers available within NHS Lothian and any such register would not necessarily identify payments to staff”. NHS Greater Glasgow: I have had no reply to my recent communication on HDL (2003) 62. Following my original FOI request (before I lodged this petition in September 2013) NHS Greater Glasgow attached a register that covered 5 years and had entries for 27 separate employees. NHS greater Glasgow is the largest health board in the United Kingdom, serving 1.2 million people and employing 38,000 staff. This NHS Greater Glasgow register for “all staff” is not available to the public. NHS Ayrshire and Arran: have promised to reply to my recent communication on HDL (2003) 62 stating that “turnaround times are proving challenging”. NHS Ayrshire and Arran stated in June 2013 “discussions are ongoing to create a register to encompass the whole organisation … we are in the process of updating our Model Publication Scheme to include this register which will be published on our public website.” I can today find no such register (other than for Board Members only) for NHS Ayrshire and Arran. NHS Lanarkshire: I have had no reply to my recent communication on HDL (2003) 62. However previously (15th May 2014) Dr Iain Wallace, the Medical Director for NHS Lanarkshire, wrote to me stating: “I can advise that it is not the intention of NHS Lanarkshire to publish a register of interests for all staff”. From the 6 other regional NHS Boards I have had no reply to my recent communication on HDL (2003) 62. I have not made further contact with the 7 special NHS Boards since my original FOI request. My understanding however is that HDL (2003) 62 applies equally to the special boards. The Scottish Government summary of the 17th April 2014 demonstrated widespread failure to comply with HDL(2003) 62. The updated evidence I have managed to gain indicates reasons to be more rather than less concerned. I have found no evidence, in any register of any sort, of declarations from “Primary Care Contractors”. The Committee may recall that before I had submitted oral evidence for the petition the Association of the British Pharmaceutical Industry (ABPI) submitted a letter to the Committee. The ABPI plan to develop what they term a “Central Platform”: from the 1st July 2016 the intention is to collect and record data of individual payments to healthcare practitioners and record these on an open database. It is important to note that healthcare practitioners will be able to opt-out if they do not wish payments to be disclosed. Despite reminders, NHS Boards are not following existing guidance. This strategy has failed for more than ten years. The disappointingly slow response of the Scottish Government to communication from the Committee only highlights the failure of the current approach. This strengthens my view that a new law would be a better way of focusing minds on a matter that may be having a significant impact on Scotland’s health. I would remind the Committee that I was first prompted to look into this when considering the widespread, off-label over-prescription of antipsychotic medications for Scotland’s elderly people. My experience was that the Pharmaceutical Industry financially supported the “education” of healthcare practitioners in this approach. I hope this update is of some assistance to the Committee ahead of the 27th January 2015. I wish to say that I am very grateful to the Committee members, and supporting staff, for all your help. Peter J Gordon is a man of many parts: a qualified doctor and landscape architect, husband and father, a family man whose interests include philosophy, sociology, ethics, evidence-based medicine, neuroscience, horticulture, sculpture, poetry, local history, photography and film-making. He writes on Hole Ousia (whole being) and has 269 films, at the latest count, on Omphalos. 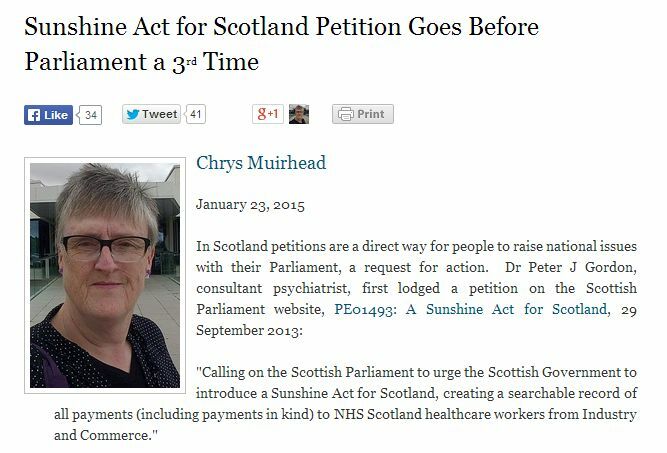 — Herald Scotland article 13 November 2013: ‘Doctor calls for drug payments register‘. In addition to petitioning Scottish Parliament, Dr Gordon has been diligently raising Freedom of Information requests in respect of Registers of Interests in every Scottish health board area. Scottish Government brought out a directive, NHS Circular HDL (2003) 62, instructing health boards to set up Registers of Interest so that staff could declare payments from pharmaceutical companies. For the sake of transparency. The health boards have not been complying with this government call to action. Nearly a year to the day after Dr Gordon gave his evidence, on 11 November 2014, his Sunshine Act petition was considered by the Public Petitions Committee at its meeting in the Robert Burns Room of Scottish Parliament. I was there to hear the proceedings, punctuated by a Remembrance Day commemoration in the Garden Lobby of parliament at 11am, and then at around 12 noon the topic came up. It took two minutes mention of contacting Scottish Government to ask about the NHS Circular HDL (2003) 62 (Registers of Interest) progress. My thoughts? Swingball. Pass the buck. See blog post I wrote following the meeting. On Monday this week a notification arrived to say that Dr Peter Gordon’s petition will be considered, again, by the Public Petitions Committee on 27 January 2015 in the Robert Burns Room of Scottish Parliament. Meeting starts at 10am and the agenda item containing the Sunshine Act should start at around 11.15am, subject to change. I have booked a ticket and plan to observe the proceedings from the Public Gallery. Live broadcasts can be viewed at this link. Videos after the event here plus links to business papers and reports. I am hoping this time around in the Rabbie Burns room for more than 2 minutes worth of talk and no direct action. A Sunshine Act for Scotland makes sense economically and ethically. 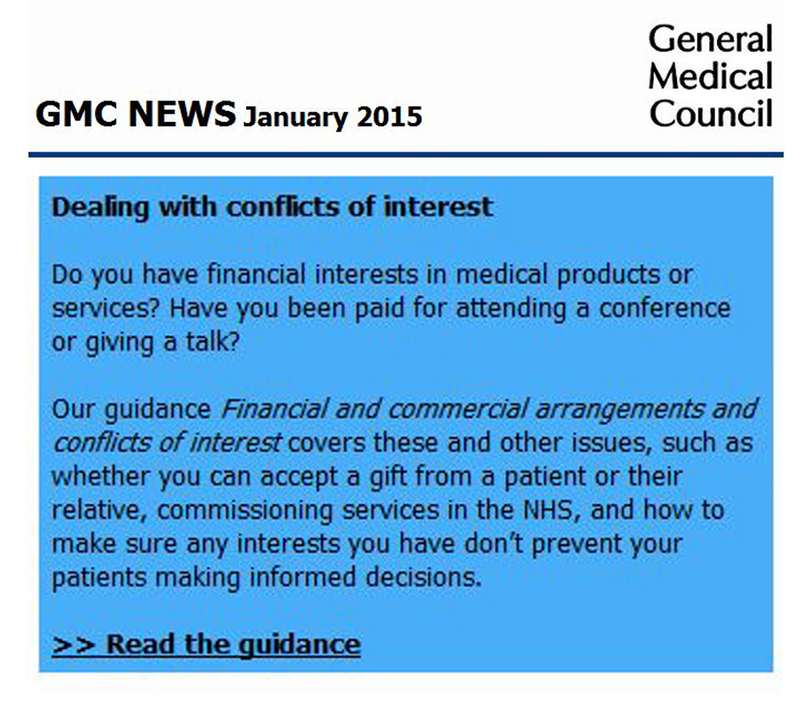 Doctors in their drug prescribing should be free from conflicts of interests. The pharmaceutical industry is primarily a money making concern. Patients deserve to know that their medical treatment is for them and not for profit. Next Post Turn again, thou fair Eliza!